Southern sea otters like Calloway are found along the central coast of California. They are a threatened species, with only an estimated 2,000 remaining. When Calloway was rescued, she was malnourished from being separated from her mother before weaning. Volunteers became Calloway's surrogate mother - bottle-feeding, monitoring swims, and helping her groom her thick fur. Sea otters have the thickest fur of any mammal with nearly one million hairs per square inch (humans have that much on their entire head!) In the wild, young sea otters are hearty eaters and may devour up to 40 percent of their body weight each day to maintain body heat. 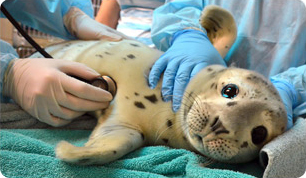 The Center, along with the Monterey Bay Aquarium, nursed Calloway back to health.